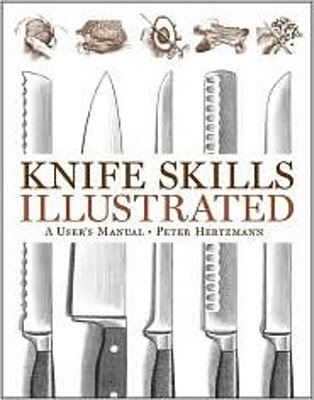 I met Peter Hertzmann, author of Knife Skills Illustrated, at a San Francisco Exploratorium event a few months ago (we're both long-time supporters of this world class, hands-on science museum). We were chatting, drinking wine, and enjoying the excellent catered hors d'oeuvres while waiting for the art and music focused program to begin. Conversation turned to food, and Peter had a lot to say as he is a cook and a foodie. He said that he was working on a new book about salt and that he'd published a book on knife skills. We talked about salt: which was best and which was not. He pointed out that Kosher salt is a US-only thing, which surprised me. We both waxed eloquent about French sea salt, which exhibits that je ne sais qua which makes it a flavoring agent rather than just, well, salt. He talked a bit about his writing and the classes he teaches for Sur Le Table. Then the program started and we took out seats. I made a mental note to get his book which was bound to be interesting. I finally got around to ordering Knife Skills Illustrated last week; it arrived today and I read it immediately from cover to cover. What a delightful and informative book. There is material about the naming, care, and selection of knives, but it's really a book about how to use knives in the kitchen, nicely illustrated by Alan Witschonke. There are basically two sections: vegetables and meats. In the vegetable section he covers individual vegetables, explaining step-by-step how to use your knife to produce professional results quickly. When it makes a difference in technique, he shows techniques for right-handed folks and for lefties. He's thorough, too; for example, the section on cutting onions runs nine page; shallots, four pages; and garlic, seven. I've had a bunch of experience in the kitchen, but his careful deconstruction of the process taught me new techniques. In the meat, fish, and poultry section, he shows how to cut poultry into pieces, debone a chicken breast, prepare fish, butterfly a large piece of meat, prepare rack of lamb for roasting, and so forth, ending with instructons for carving whole poultry. I will take the latter to heart the next time I have to contend with a roast turkey. Anyone with ambition in the kitchen will find this book helpful. It's not a deep book about the philosophy of food or the calculus of taste. You are likely to read and refer to it over and over again. You will learn many new techniques to incorporate into your own particular style in the kitchen. If you want to step away from the practicum and read about food, visit Peter Hertzman's á la carte website. I'd recommend his essay assaionner and Les Secrets de la Cuisine, among others. Find Knife Skills Illustrated on Amazon.